The Youth Expo is a city-wide initiative among the Islamic Centers around Pittsburgh. 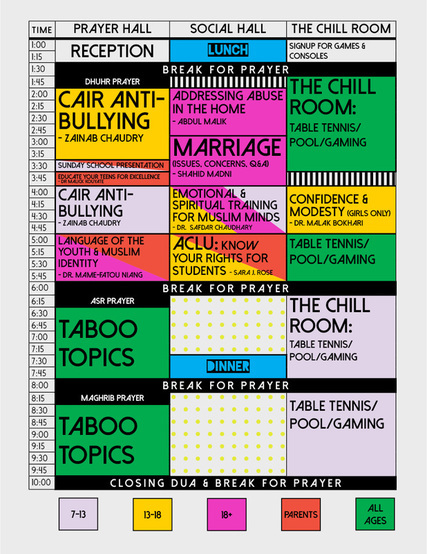 Its a day-long festival of workshops, discussions and lectures exclusively geared towards addressing many issues that our youth face on a daily basis. Youth of all ages and their parents are welcome to attend. In addition to talks, there will be a Chill Room with fun games and competitions or to just take a break and hang out with friends; and a bazaar for community members interested in selling items. Lunch and dinner will be provided. Babysitting will be offered all day FREE of charge for children under 7 years. Street parking is available with this parking variance. You can download, print and place the variance on your car's dashboard while you are parked around ICP. A schedule of talks and sessions is included below. For more information and to learn more about our speakers, please see below click here. To submit a question anonymously to our panel of experts for our Taboo Topics segment, please click here. The entire event is FREE and open to the public (no registration required), so bring your friends and join us for this one-of-a-kind event tailored just for the youth! If you have a hobby or business and would like to reserve a spot at the bazaar to sell your own goods, please send an email! The vending fee is $20 per table.